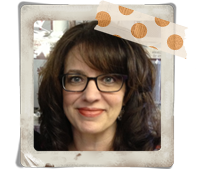 Until I can share any exciting news about me, I want to share some exciting news about my sweet friend, Monika Davis, who is this week's featured stamper on Splitcoast! WooHoo!! Monika is an amazing designer, seriously making one-of-a-kind creations and are all Monika! And she is about the sweetest person around so there's no way I couldn't CASE one of her cards to play along with the challenge!! You can see Monika's original card here. For my card I used a fun background stamp from Impression Obsession, a darling ticket stamp (and die) from The Cat's Pajamas, and a big 'ol heart image from Paper Smooches. Hop on over to SCS and check out Monika's gallery and then play along with this week's challenge! Hey, guess what? 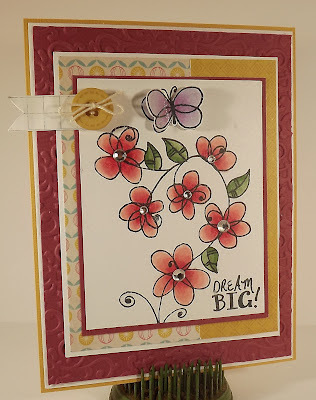 It's card sketch challenge day over on Splitcoast! And I'm playing along with the challenge this week! 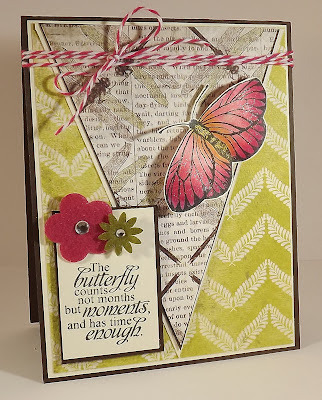 My card features fab paper from My Minds Eye and a darling butterfly stamp from Sweet 'n Sassy. 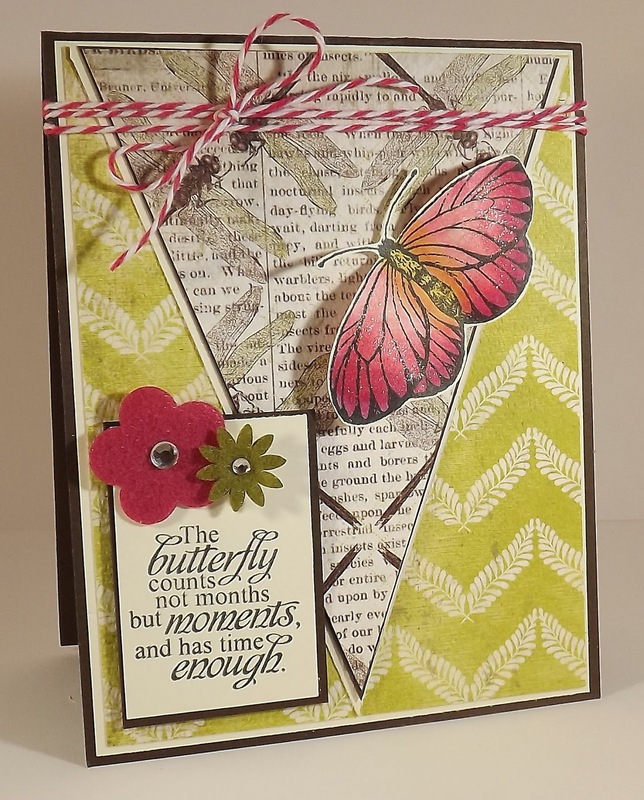 The butterfly and sentiment is from the Seeing Spots stamp set!! 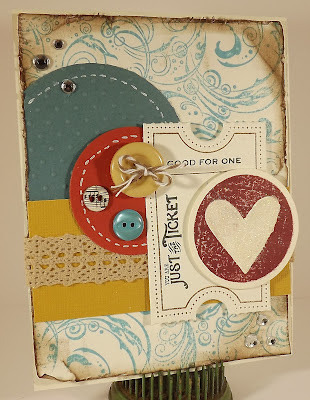 Go...now...and check out the challenge and then create a card and play along!! This page features papers from Authentique...oh, how I love their products...and a few stamped images from PSA. The tiny heart, utensils, and the bursts (they're actually snowflakes!) are all from PSA. Don't the snowflake images look like little fireworks? Love that! 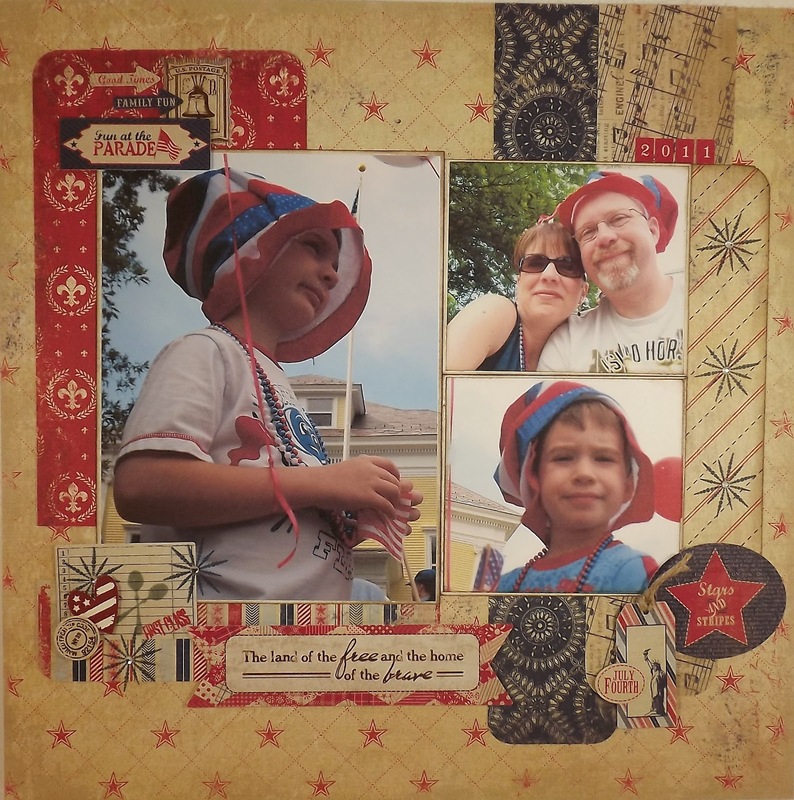 You can visit this link on the PSA blog for more photos! Well...I'm not sure how I feel about thinking of Christmas and snow in the middle of July but I do know that I am super excited to share the news of Sweet 'n Sassy's mid-July holiday party and release!! Wait until you see what fun sets Korin has to share! And all of the beautiful work by our super talented design team and friends...love it!! How about the details on prizes during the hop and links to the other creations? Keep reading! 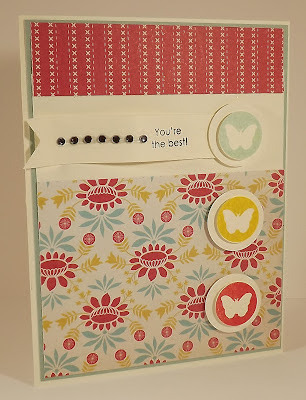 This page was created using Crate paper (love Crate) and stickers, which coordinate perfectly, also from Crate. These sweet pictures are of my cousin's daughter. Isn't she beautiful? 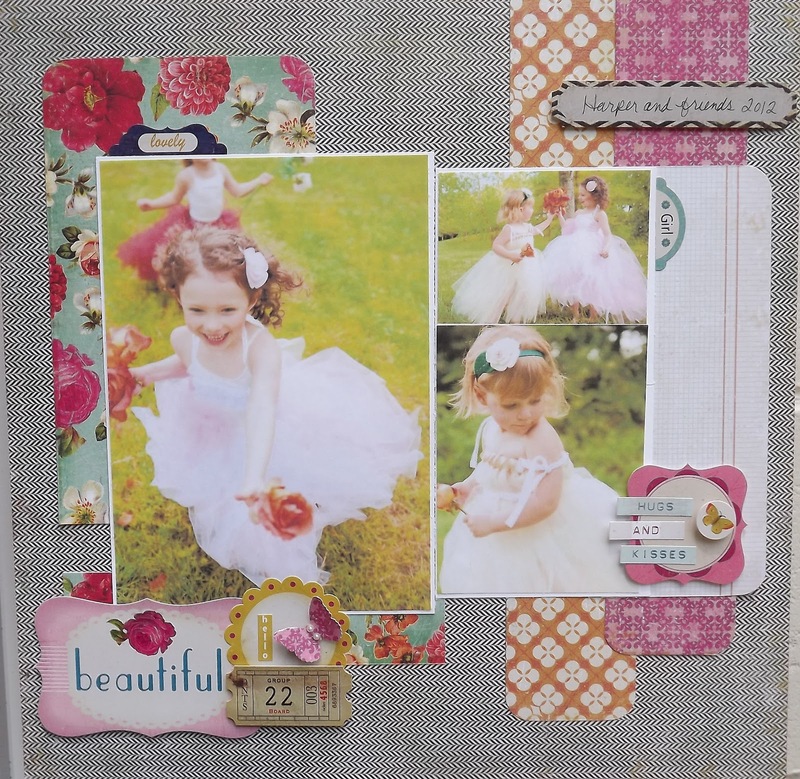 :-) And...my cousin makes the darling tutus shown in the photos. Here are a few close up shots of the stickers. 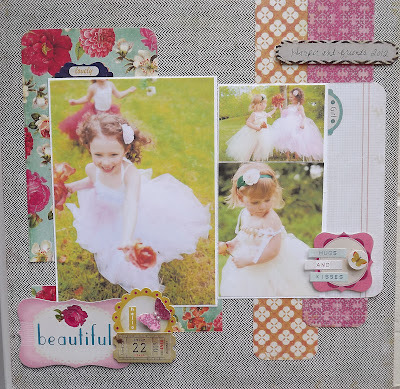 I love stickers that coordinate with scrapbook pages, it makes adding embellishments so quick and easy. 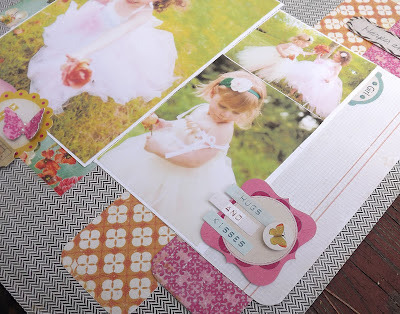 Use a little foam tape and you can add lots of layers too! 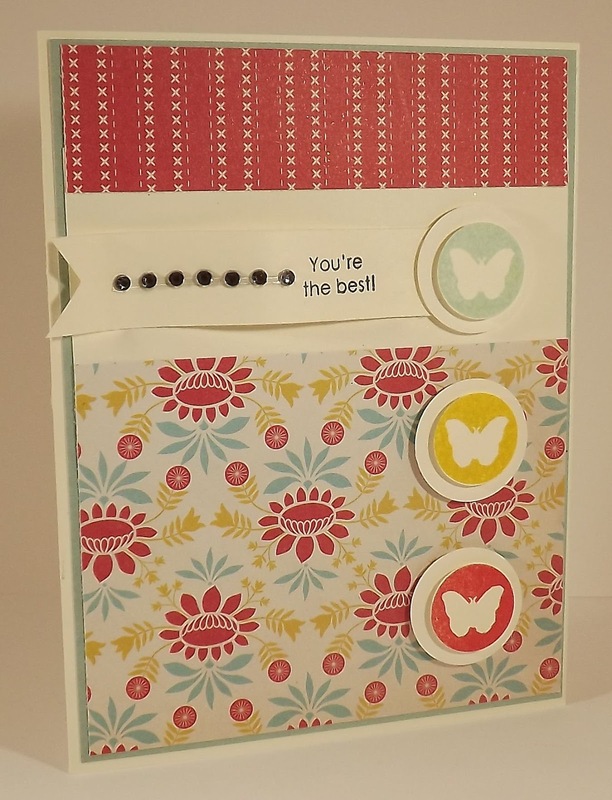 This sticker set also included words so it was a cinch to even add sentiments. Fun stuff! Thanks for stopping in today and be sure to check back on July 19th for Sweet 'n Sassy's Christmas in July blog hop! Great new releases and prizes!! Oh, for anyone interested, my husband's knee is fine! As in a-ok! But his leg...is not...Turns out he has a compression fracture of his femur! Huh?? We were shocked to find this out but so thankful that surgery will not be required. And since he's basically be walking around, although being in a lot of pain, on a broken bone for a month there's nothing more to do for him. He just needs to continue to take it easy, rest, and let his leg heal. Take care and be sure to check back on Thursday! 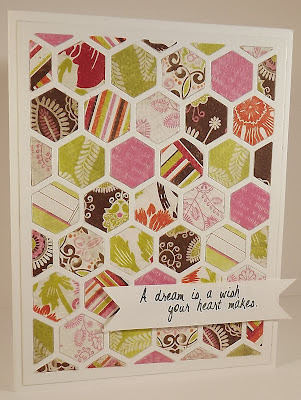 The other big reality in my life these days is that I love this new hexagon craze that's going on in the craft world right now! Love, love, love it! I love it so much that I went out a purchased the new hexagon die from Papertreyink! 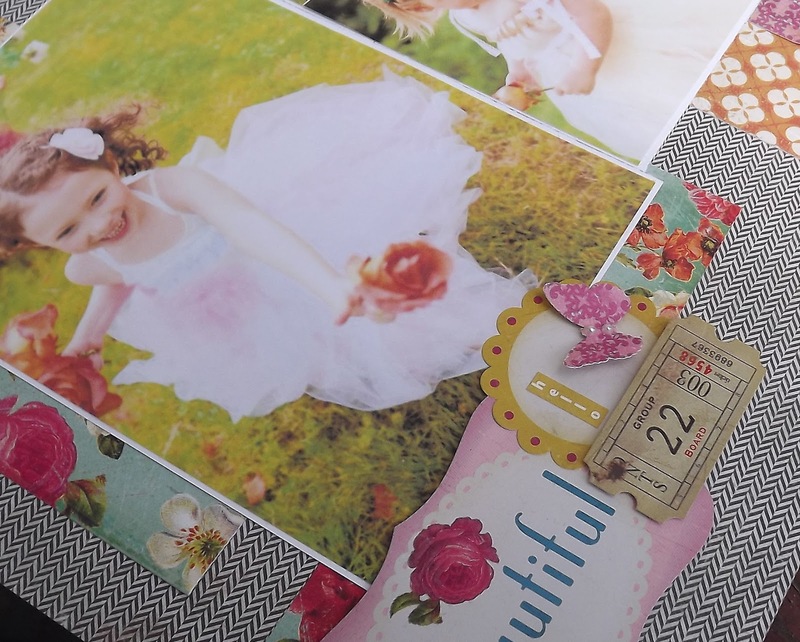 What a great way to showcase designer papers! This is new paper from Authentique...another one of my latest loves. The fun thing about this die is that it cuts out the frame so it's a cinch to add the individual paper pieces, all spaced perfectly. Want to know my trick for attaching all of those small hexagons? I used a sheet of Wonder Tape! I first put the hexagon grid on to the Wonder Tape (removing only one side of the tape) and then I got to work on adding the hexagons. Once the entire grid was filled, I removed the back of the Wonder Tape and secured it to my card base. Fun stuff!! 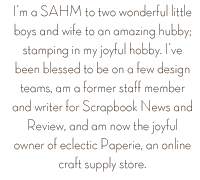 And this paper is so pretty I couldn't cover it up so I just added a sentiment. Hey guess what? I had the opportunity to stamp last night...just for fun! And for today's sketch challenge, hosted by Sweet 'n Sassy's very own Taylor! It's been far too long since I've had the time to participate in a SCS challenge and I was excited to have time last night. Enjoy today's card and be sure to check out the sketch challenge and play along! Sweet 'n Sassy July Release Day!! Greetings blog friends and welcome to this month's Sweet 'n Sassy release blog hop!! Isn't seeing all of the beautiful stamps, dies, and creations the best part of release day? I *puffy heart* release day!! Well let's get right to today's cards!! 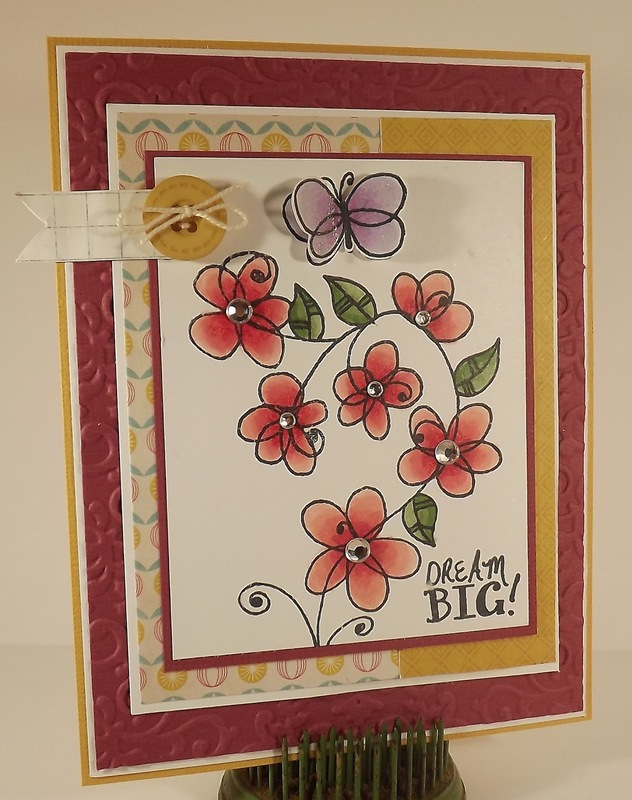 My first card features the whimsical floral design from the Dream Big stamp set. I love this large image as it can be used in so many ways...the whole image, just a portion, monotone with one of the great sentiments, included in the set, stamped over the image. I love possibilities!! The flowers are colored with Copics and after attaching a second butterfly (for some dimension don't ya know) I added a few rhinestone flower centers for a little bling. The DP is from My Minds Eye. My second card features this serene bridge and water scene, from the Bridge of Hope set...isn't it beautiful and so perfect for sympathy or I'm thinking of you cards? It communicates a calmness and peace. 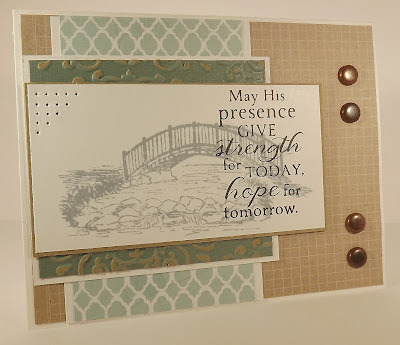 I kept this card fairly simple, stamping the bridge in a pale blue, which coordinates with my Kraft core and Authentique paper. Then I simply added one of the sentiments and four large brads. Comment on each blog on the hop and be entered into a drawing for a GRAND PRIZE of the entire July release! 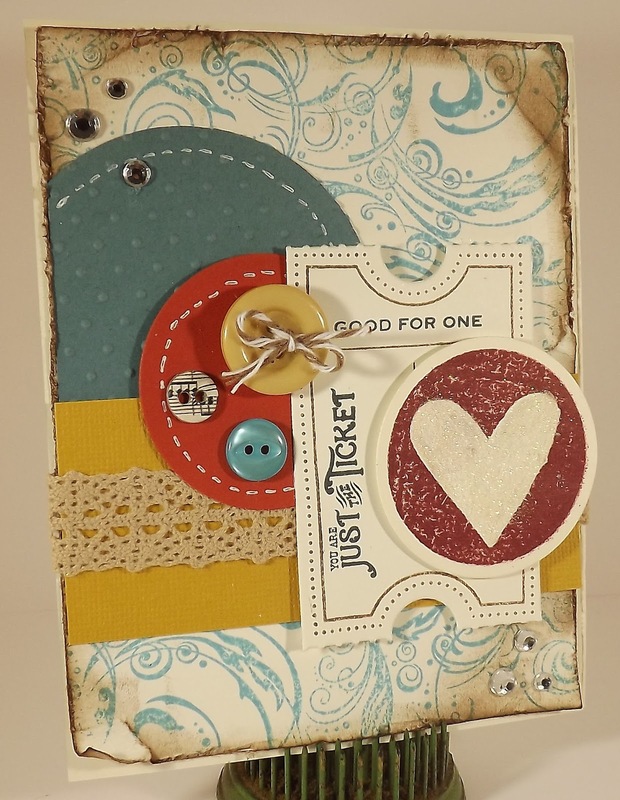 All of the stamps and dies released today! But that's not all...you also get to see all the crafting goodness on the other DT blog, check it out here! Next on the hop, after me, is Dina Kowal. Enjoy!! You know like where's Waldo? It's been hard to find me lately...I'm still alive and kicking and have actually been fairly busy crafting but it's nothing I can share yet...darn. I promise to be back soon...just need to find some time to fit in my crafting!! Oh, I will be able to share new Sweet 'n Sassy creations on Monday! WooHoo!! Be sure to check back on Monday for all the blog hop details. Until then, thank you so much for your patience! Sweet 'n Sassy is hosting a July 4th sale from now until Friday, July 6th! 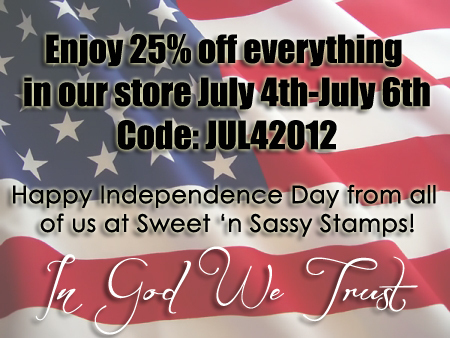 Just enter the code above and enjoy 25% off everything in the store! Enjoy and wishing everyone a wonderful July 4th! I just posted a note on a forum that I coudn't believe Christmas was only six months away...egads, the time goes by quickly, doesn't it? So I thought I'd share a CAS Christmas card, featuring stamps by PSA Essentials. 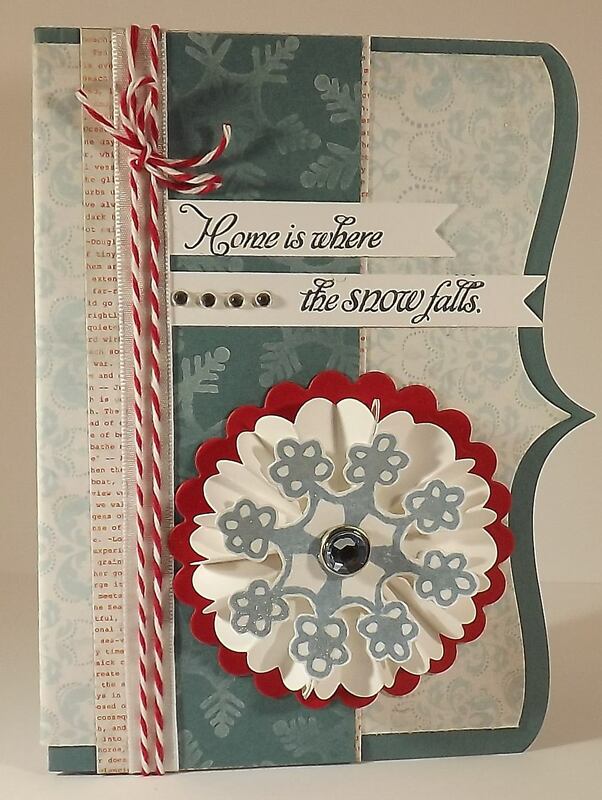 I created this card by stamping with various holiday images on to a piece of cardstock that matched my card base. I used the same color ink (as the cardstock), which creates a nice watermark look on the paper. 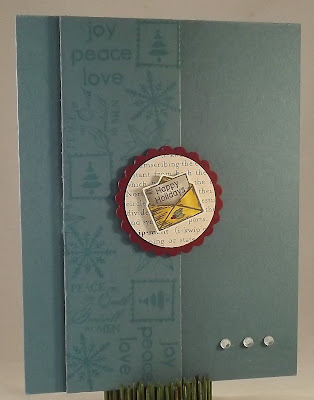 Then I just punched out a scalloped circle and plain circle as a base for my tiny Happy Holidays envelope. I popped up the piece of stamped cardstock with foam tape so it's not laying flat against the card base. Three little rhinestones finished off today's card!